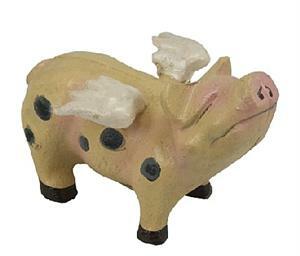 Here's a pig cutie - a pig figurine endowed with wings that don't fly. Created from cast iron and then finished in color, our flying pig figurine adds a whimsical touch to the desk or as a unique pig gift. Sold as a set of 2. Dimensions: 3"H x 5" x 3"
Do you know that the city of Cincinnati, Ohio celebrates its 19th Flying Pig Marathon in 2017? The marathon raises funds for charities and invites all athletes to take part in its annual event. The pig is a symbol of Cincinnati which draws pride in that hogs were the livesource of the state’s income. The state produced so many pigs that it came to be known as Porkopolis. In 1988, the city of Cincinnati decided to celebrate its Bicentennial and renovate its riverfront to include a “Bicentennial Commons” park. UK sculptor and designer Andrew Leicester was commissioned to design the commons so that it reflected the city’s past. In his plans, Mr. Leicester suggested that the entrance to Bicentennial Commons would be four smokestacks to mark the city’s riverboat heritage, with four flying pigs on top. He said the flying pigs would reflect the spirits of the pigs who gave their lives so the city could grow.